Peter Senge is one of my favourite Thought Leaders. You will probably know that he has been around for a while but his message, at least for me, is as relevant to our current time as it was when he first introduced his book, The Fifth Discipline, twenty something years ago. So far, in my experience anyway, we have not been great students of his philosophies…or we have been great students but just, well, crappy at the execution part, proof perhaps that naïveté also lives in our belief that any of this stuff is easy. There was a time when everyone was jumping onto The Learning Organization bandwagon. This usually happened when times were good, when organizations felt a little more ebullient about their prospects and generous toward their employees. And then when things started to look a little gloomy, heads turned back to the way things were. Budgets were cut and the Learning part of the organization dried up while the focus snapped back in line with the notion that wisdom and decisions could only come from the few and learning for the many was a luxury no one could afford. I’m thinking though that it is in the difficult times that leaders need to embrace the concepts of the Learning Organization and to build a culture of shared leadership. I must confess that not being particularly academic in my own learning process, I found The Fifth Discipline a little dry. Having said that, I also think the five main components of a Learning Organization continue to make great sense and are actionable, to greater or lesser degrees, by everyone regardless of whether we lead in large organizations, small ones, or are simply striving to lead a meaningful life. Each of the Learning Organization components, personal mastery, mental models, team learning, shared vision and systems thinking allow for the opportunity to create lives and organizations that are resilient, flexible, inclusive and dynamic. The question often is though, how do we to start? Personal Mastery: is, for me, the place where everything really begins. Taking the time to study and understand our reality, and our purpose, serves not only ourselves but also everyone with whom we come in contact. 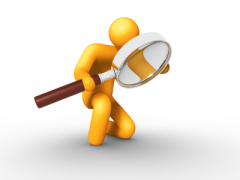 Practically speaking, there are a lot of instruments available on the Internet that will help us confirm what we might already inherently know about ourselves or uncover some things we didn’t know. However we do it, the key to successful personal mastery, I think, is to trust in the information we receive; to be curious and ask questions either formally or informally; to observe the impact we have on others when we interact with them; and to act on any new knowledge we get about ourselves. Mental Models: are, simply put, about assumptions and biases in our thinking. There is a proverb that says, “If the only tool you have is a hammer, everything looks like a nail”. This speaks to the dangers of clinging to, and operating from, narrow perspectives. 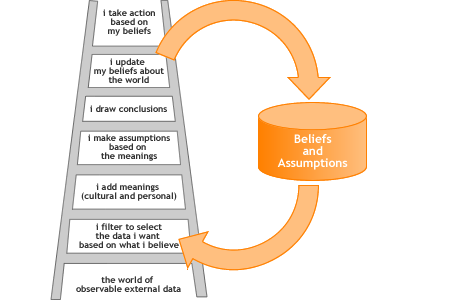 I believe the goal for leaders in this century is to widen the lens of their thinking by challenging not only their own assumptions but also the beliefs and biases on which their organizations operate. I hazard to say that if we were each to bring heightened awareness to our assumptions, our ability to be receptive to change would be that much greater. Team Learning: There are many books written on the topic of teams, and an amazing array of teams within organizations too. It can get pretty complex. But suffice it to say that in an age where shared leadership is, or will become, critical, the need to understand the dynamics and functional operation of teams is pretty great. Here, I think it starts with gaining an understanding of what a truly successful and highly functional team looks like. In my observation, it always seems to come down to how team members communicate with each other; how they manage conflict and; how they examine their successes and more particularly, their failures. Shared Vision: I expect this one is pretty familiar to most people. And yet its usefulness is so often diminished because the vision is developed at the top of the organization and seldom shared by those who are expected to work toward its achievement. To me, a Shared Vision is just that…shared. It may start with one person but if it is going to come alive and guide the company’s activities, it must be embraced and shared by all. It doesn’t have to be a sweeping statement with big words either. For example, Zappos.com, the online department store’s vision is, Delivering Happiness. It is a clear, simple statement that provides great direction to anyone who works there. To me, the message is, if what you do delivers happiness, it’s probably the right thing. 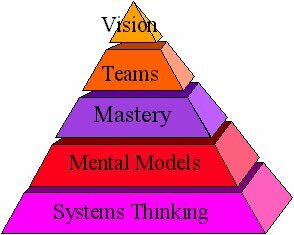 Systems Thinking: When most people talk about Senge’s model of a Learning Organization, they usually start with Systems Thinking. I keep it to the end because really this is about paying attention to the connections between and among a variety of elements that make up the whole. In organizations, we have this tendency to create silos of operation where people make decisions based only on their own needs. When this happens, others are affected, (often negatively) and that creates unnecessary and unproductive tension within the organization. So, I suppose a place to start with respect to systems thinking is to ask, Who will be affected by what we are about to do? How do we involve them? Why should we care? Really, systems thinking is kind of like the plumbing in an old apartment complex. If there is a breakdown in one person’s apartment, it can affect the water supply to all of the others. Some people may think the concepts put forth in The Fifth Discipline are old too. But, I think that they are timeless. If more organizations were to embrace and enact these philosophies, they would find ways to remain pliable and resilient in even the most treacherous of time. When I got all the way to the top of the ladder and acted in accordance with my assumptions and beliefs, I was met with hostility rather than the appreciation, or at least neutrality, I was expecting. Peter Senge is one of my favourite Thought Leaders. You will probably know that he has been around for a while but his message, at least for me, is as relevant to our current time as it was when he first introduced his book, The Fifth Discipline, about twenty years ago. Team Learning: There are many books written on the topic of teams, and an amazing array of teams within organizations too. It can get pretty complex. But suffice it to say that in an age where shared leadership is, or will become, critical, the need to understand the dynamics and functional operation of teams is pretty great. Here, I think it starts with gaining an understanding of what a truly successful and highly functional team looks like. In my observation, it always seems to come down to how team members communicate with each other. How they manage conflict. And, how they examine their successes and more particularly, their failures. Here’s more about team learning in case you want it. Shared Vision: I expect this one is pretty familiar to most people. And yet its usefulness is so often diminished because the vision is developed “at the top” of the organization and seldom shared by those who are expected to work toward its achievement. To me, a Shared Vision is just that…shared. It may start with one person but if it is going to come alive and guide the company’s activities, it must be embraced and shared by all. It doesn’t have to be a sweeping statement with big words either. For example, Zappos, the online department store’s vision is Delivering Happiness. It is clear, simple and provides great direction to anyone who works there. To me, the message is, if what you do delivers happiness, it’s probably the right thing. To me, it’s kind of like the plumbing in an old apartment complex. If there is a breakdown in one person’s apartment, it can affect the water supply to all of the others. That might be a bit simplistic but I think you get what I mean.